Big changes are already underway at the Channelside complex that has been a focal point of Downtown Tampa’s waterfront for years. What was known as the Channelside Bay Plaza retail center has been rebranded and reimagined as a mixed-use development that is a major departure from its former self. 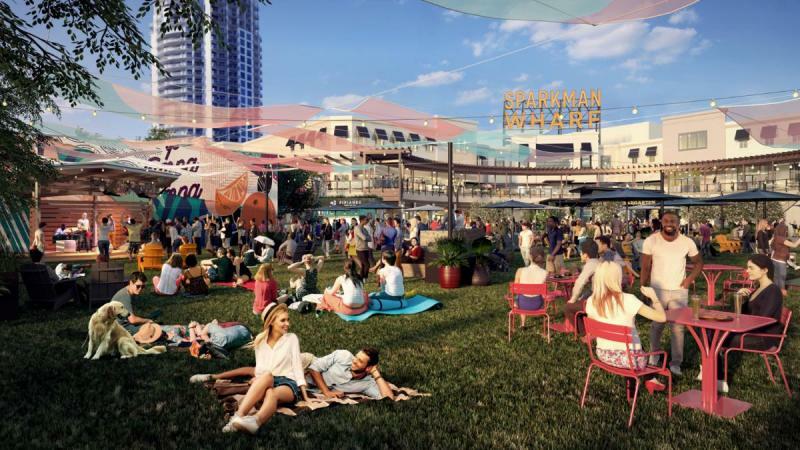 This dramatic transformation of a prime waterfront parcel neighboring another exciting downtown development, Water Street Tampa, will introduce exciting new ways to play, places to dine and spaces to work when it debuts this fall. 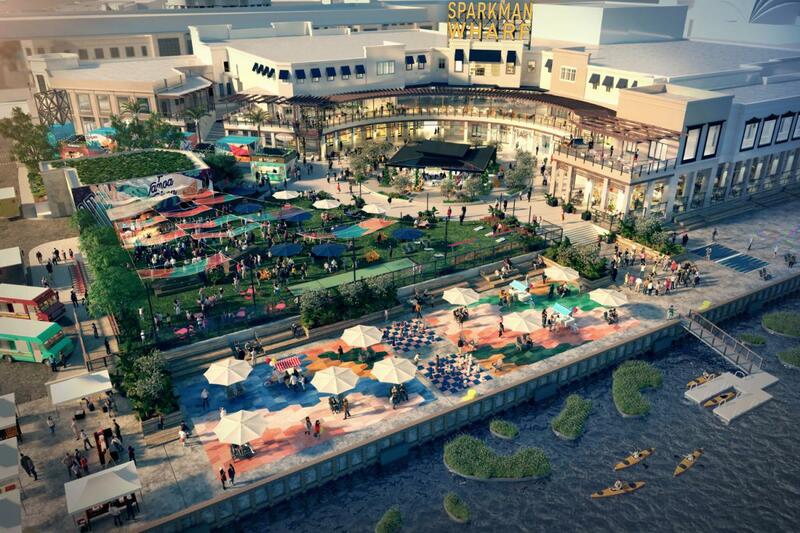 Get ready to welcome Sparkman Wharf and all of the wonderful concepts it will create when construction is completed in October. The newly configured space will combine the culinary creativity of a food hall with the wide open spaces that make Curtis Hixon Waterfront Park such a popular event venue and community gathering spot. It will also incorporate loft-like offices and a Biergarten with a big emphasis on Florida craft beers. The massive makeover will result in 180,000 square feet of workspace with 65,000 square feet of ground-level retail and park that marks a much more inviting, open-air destination than its predecessor. Elements being incorporated include what is described as an intimate dining garden, a distinctive, outdoor area serving beer and a lawn suitable for lots of recreational activities. Strategic Property Partners, LLC, a Tampa-based real estate development project, is at the helm of the concept being built by EWI, a Tampa-based contractor. Located along Garrison Channel, this welcome addition will add to a waterfront that already features the Florida Aquarium, Port Tampa Bay cruise ship terminals and the Amalie Arena. Entertainment will be integral to keeping crowds coming. A band stage featuring local artists will add live music provided through a partnership with the Gasparilla Music Festival. Also on-scene will be a 9.5-foot by 17-foot LED screen that can broadcast anything from TED talks and Tampa Bay Lightning games to movies after dark and other local sports. Ten top chefs and restaurateurs from this areas will be adding innovative, new-to-Tampa street-food concepts that will be ideally enjoyed in the dining garden. Culinary pros already confirmed include Foundation Coffee, a local coffee purveyor, and Whatever Pops, which specializes in popsicles and various frozen treats. For those with a thirst for more, there is the Fermented Reality open-air Biergarten that will offer more than 30 taps, with the bulk of those featuring made-in-Florida craft beers, along with wine, iced tea and natural sodas, all served from a 3,000-square-foot covered bar that features shaded space. Other plans announced include transforming the existing Mediterranean-style façade to a more industrially-inspired exterior, adding a two-story office lobby mid-block along Channelside Drive and creating centralized, direct access to the office space. 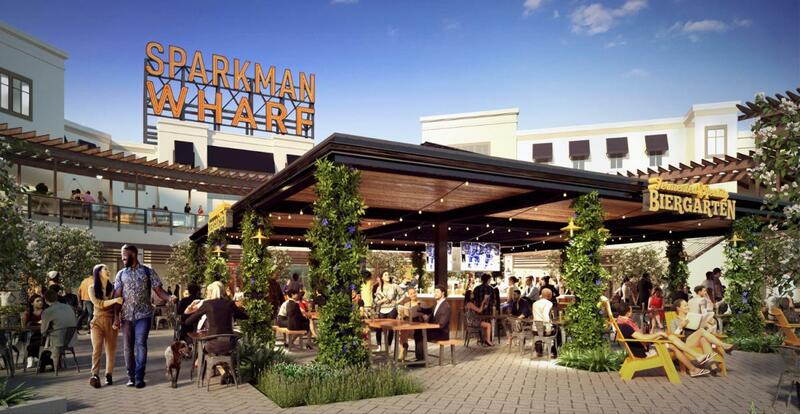 Wonder what sparked the Sparkman Wharf name? Stephen Sparkman, one the region’s first Congressmen and a mover-and-shaker of his time, is about to have his name up in lights, or at least big letters. He secured federal funding to dig the deep-water channels to downtown that created Port Tampa Bay and enabled large ships to dock here. Today Port Tampa Bay is Florida’s largest port. Perhaps we should all raise a glass in his honor in the Biergarten. Want to know more about what else is developing in Tampa Bay? Simply register at 813Area or 727Area. It's easy and free! Images provided by Sparkman Wharf.